Apply now for an immediate decision on your loan application. Get a quick decision on your loan application. 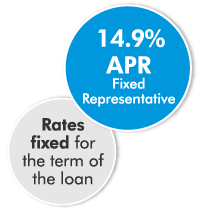 Representative Example: If you borrow £5,000 over 5 years at a rate of 14.9% APRC fixed, you will pay 60 instalments of £116.26 per month and a total amount payable of £6975.60. This includes the net loan, interest of £1975.60, a broker fee of £0.00 and a lender fee of £0.00. The overall cost for comparison is 14.9% APR.